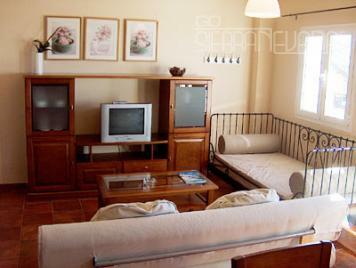 The best living quality in the Sierra Nevada: The apartment is stylish furnished, very clean, comfortable and practical. Here you have a fantastic opportunity to use the ski resort and enjoy the mountains of the Sierra Nevada, winter and summer. Galatino is a holiday complex of 14 apartments, honoured with the Q for tourism quality. The two bed room apartment is well equipped to cook at home, appropriate crockery, new household appliances such as dishwasher, toaster, coffee machine and other utensils are available. You will find high-quality mattresses, bed linen and towels. It offers heating and steady hot water, the spacious bath room is equipped with a thermostatic shower. You have a private terrace from which you have a wonderful view of the ski slopes and the village of Pradollano. Pleasure is written large, day and night: skiing at night, tapas bars, restaurants and nightclubs are to find next to the runway. The apartment has a garage and a ski - storage, all included in the price, there is also a wireless Internet connection. Another advantage is that you can activate the lift pass at the reception of the complex, without queue. The complex is located in the upper part of Pradollano, but you have easy access to the village, a bus stop is directly outside the door. The lifts are in the vicinity of the accommodation and 300m away is the sports center Alto Rendimiento Deportivo (ice rink, indoor pool, fitness center). Perfectly located in this stunning landscape, this is the perfect place for holidays with family, partners or friends. ADVICE: The prices include the 10% VAT.